One great shift does not translate into a win, and the Pens found this out. As remarkable as it was to see Craig Adams and Matt Cooke score on the same penalty kill early in the 1st period, that was just about how unremarkable the rest of the game went for the Pens. Maybe it was too much time in the Florida sun, because the Lightning were the more focused and determined team and methodically chipped away at the Pens' early lead to get themselves the victory. Martin St Louis and Steven Stamkos were the duo to beat, with St Louis taking control with a game winning goal and the EN clincher and Stamkos tallying 3 assists. It seemed that the Pens were doing a good job preventing Stamkos from unleashing his vicious shot but instead allowing him to distribute the puck nicely to his teammates. St Louis put the dagger into the Pens when he took the puck right around Ben Lovejoy on a breakaway and then lifted the puck past Fleury into the net to put his Lightning up 4-3. Penalties were also an issue in this game, with the Pens taking 9 minors and Tampa getting whistled for 6. The Pens obviously got off to a good start with their special teams (2 shorthanders always help) but were unable to do anything productive on the other side of the man advantage. Also note that it was the Pens debut for Arron Asham, and had it not been for a few minor skirmishes, nobody would have even noticed. St Louis's breakaway goal to put Tampa up 4-3. Offense- B- They got good work done by their 3rd and 4th liners, but the guys at the top were silent. Defense- C+ Lovejoy wasn't the only one to get burned on a breakaway. The D looked very sluggish in getting back to the D zone, and paid for it a few times. Fleury- C Inexcusably atrocious first 2 goals let in. The other 2 weren't really his fault. I just don't know when he will get back to his game, but his huge buffer on the starting job is starting to dwindle and every good game Johnson plays further decreases this window so Fleury would be smart to step it up soon. Powerplay- C- For lack of a better word, they were just lousy. Penalty Kill- A- Those 2 shortys really were spectacular and the one goal they did give up was on the 3 v 5 so it really can't be counted as a PK failure. They were out on the ice too much in the 1st place, and did a nice job at least keeping the game within reach. -Didn't the Pens pick up Mike Comrie in the offseason? I always see someone out there wearing his number, but #19 is never anywhere near the action. -At least Brooks Orpik looked good. Didn't seem to have any lingering from his injury, and was a force as usual in the defensive zone. 1. 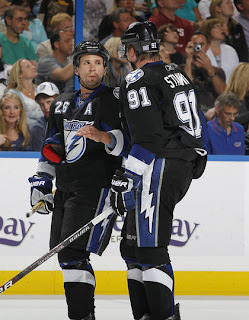 Martin St Louis- 2 goals, assist, gwg. Shoe-in for #1 star. 2. Craig Adams- 3 points for a grinder like Adams. He was really determined tonight. 3. Steven Stamkos- 3 assists, and a very well-played smart game.